I hate driving the rush hour home, but I’m upholding a promise I made on my wedding day to stay off the push iron when the ground is white! At the time it seemed like a perfectly reasonable thing to say, but set there in the car, listening to a less than average radio DJ, staring at the brake lights in front of me, and contemplating spending the next hour doing so, i began to wonder! My mind began to wander……. “snow tyres” Hmmmmmmm. You must be able to get them, in fact I’m sure I’ve read about them….. When I got home, I had a look on Google, and to be quite honest, they’re a little thin on the ground if you live in the UK. If you live in the US or Canada, there’s plenty of choice, this guy based out on the East coast offers a large stock, but more importantly, offers some very useful advice. Especially regarding the question I had in my mind over whether just a front tyre is sufficient. He suggests not, I dunno, but I’m not going to argue, he may just be trying to double his money! Neither of which are looking particularly suitable for the road bike and the commute to work! 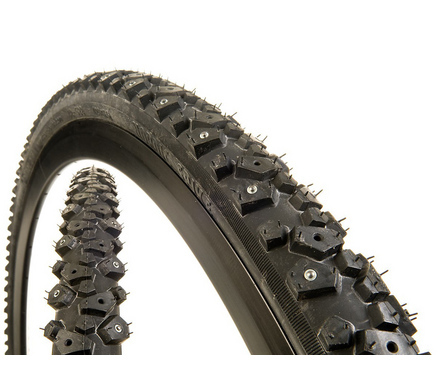 And in either case, looks aside, they simply aren’t available in 700c, they are clearly mountainbike tyres, which, looking back at some of the photos I’ve posted of snow rides, might be quite fun, but there is no choice for the roadie. C’mon guys, spikes for the road bikes!! It would seem to me to be obvious, it’s not like you can’t get them, for some reason, someone thinks it doesn’t get icy in the UK!? Well i got away without a dance on the disco tarmac at the beginning of this year, mainly by upholding a promise and staying off it, but the year aint over till the end of December!